ShiJiaZhuang Huihuangyuan Commercial Trade Co.,Ltd. [Physical properties] often by biotite or phlogopite was false. Mostly brown, cinnamon, golden, bronze, sometimes with green. Weaker than the mica sheen, oil sheen or pearl luster. Cleavage completely, a flexible sheet. Hardness of 1 to 1.5. The relative density of 2.4 ~ 2.7. Polarizing microscope: multicolor and colorless to light brown. Biaxial crystal (-), the optical axis angle is small. Ng = 1.545 ~ 1.585, Nm = 1.540 ~ 1.580, Np = 1.525 ~ 1.560. 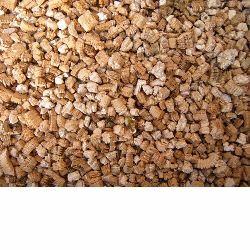 Expansion; cation exchange and adsorption; expanded vermiculite also has good water absorption; sound insulation; heat insulation and fire resistance; resistance to freezing tolerance; expanded vermiculite of chemically stable. Insoluble in water. pH 7 to 8. Non-toxic, tasteless, no side effects. [Occurrence and composition] mainly of biotite and phlogopite by low-temperature hydrothermal alteration of the product. Part of the vermiculite from the biotite formed by weathering. [Identification of features] similar shape and biotite, but the luster, cleavage level, hardness, elastic sheet weaker than those of biotite. When burning a strong expansion of its main features of the volume. 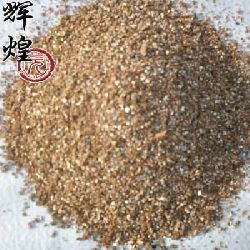 [Industrial Application] is mainly used for agriculture, environmental protection, and building materials. Other applications: friction materials as a filler added, can play a reinforcing agent, heat stabilizer role. With brake pads made of vermiculite has good heat resistance and shear, bending strength, braking effect is good. 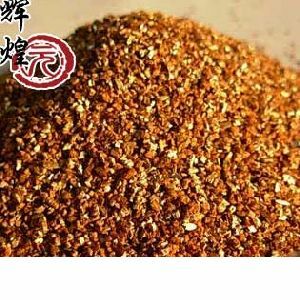 With vermiculite as the carrier of essential oils made of spices, incense for a long time with scattered features.